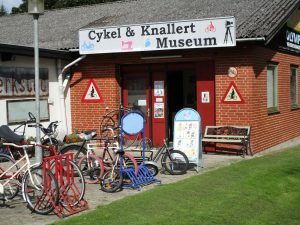 “Dansk Cykel Museums Venner” and “Sjællands Veteranknallert Klub” have joined forces to create a unique and vibrant museum showing all the two-wheeled development and its consequences, as the two clubs together have the largest collection of two-wheeled vehicles in Scandinavia. “Dansk Cykel Museums Venner” was founded in 1988 and have since then achieved the largest collection of bicycles and bicycle history items in Scandinavia. “Sjællands Veteranknallert Klub (SVK)” today Zealand’s largest and most active club with many member activities and races. Its members makes an invaluable effort to promote and maintain the museum’s mall. The history of the cyclists and the mopeds is shown in the showroom and tableaux. Also there is a chance to try some of the old vehicles and for the young and the kids there are fun and fair bikes available. In the area around the museum there are seats where you can enjoy your lunch. The museum is open Saturdays and Sundays from May to October in the station city of Glumsø in the triangle Ringsted – Næstved – Slagelse.